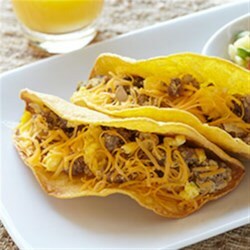 "Lots of spices in this ground bison and egg omelet make for a great taco filling, and the pineapple salsa with fresh cilantro is the perfect topping." Cook ground bison and onion over medium heat in a large skillet until ground bison is brown and onion is tender. Drain off fat. Stir in cumin, salt, coriander, cayenne pepper, and water. Cook and stir for 2 minutes. Whisk eggs and milk in a medium bowl. Add to ground bison mixture in skillet. As the mixture sets, run a spatula around the edge of the skillet, lifting egg mixture so uncooked portion flows underneath. Continue cooking and lifting for 2 minutes or until egg mixture is almost set. Evenly divide ground bison mixture between taco shells. Sprinkle with cheese. Serve with Pineapple Salsa. Pineapple Salsa: Stir together pineapple, bell pepper, onion, cilantro, lime juice, jalapeno pepper (if using), and salt in a medium bowl. Refrigerate for up to 24 hours. *To warm, wrap tortillas in paper towels; microwave on 100 percent power (high) for 30 to 45 seconds or just until warmed.